It's almost Christmas, and we're at the peak of joy and togetherness. This is halfway into the holiday season. Hardworking loved ones are having their much-needed break. Everyone's relaxed. It's a nice feeling. Now, imagine if there were week long holidays every month of the year! I guess we'd all be smiling from ear to ear. 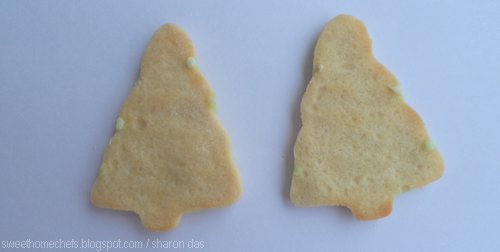 I did hint in my previous post that I had baked Christmas Tree cookies. I'm finally unveiling it today. This is a Nigella Lawson recipe. I chose it because it was simple. My strategy has always been not to make complicated food on days I have much to do and this happens often during the holidays. There's extra housecleaning, the kind that happens seasonally, and lots of outings ...lots! Additionally, if I decide to organise a party, I'd rather catch up with people than try to wow them with something elaborate on the dinner table ..unless I have help, of course and if it's an event where everyone chips in. Otherwise, it's always quick and easy food for me during the festive period and more difficult ones, after! So this is it - an easy one, but no less pretty. 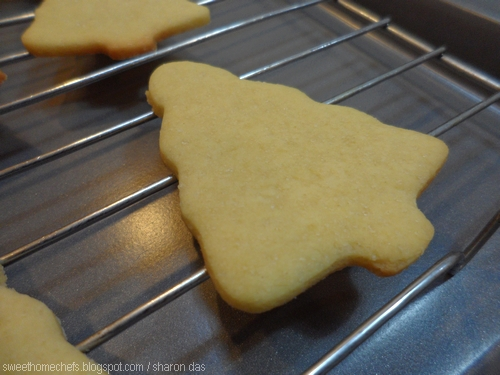 Click here for the ingredients and how-to on 'Cut-Out Cookies'. 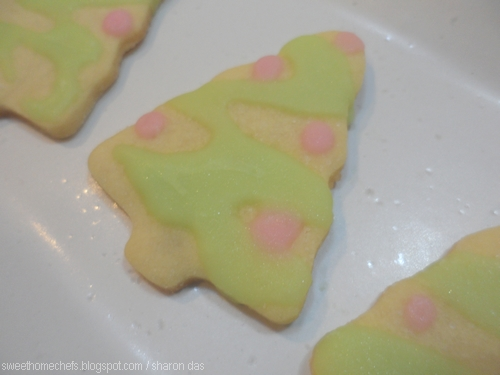 These cookies are sweet enough on its own but this is meant to be a festive treat. Therefore, the little extra icing, I think, wouldn't hurt. 1) Creaming butter and sugar together. 2) The egg and vanilla is added. 3) Dry ingredients consisting of flour, baking powder and salt. 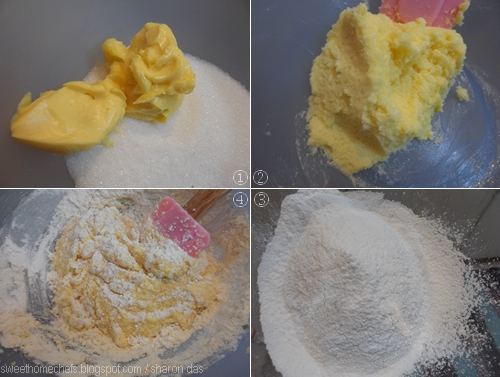 4) Combining wet and dry ingredients. 1) My cookie dough. 2) Form a flat disk, wrap and refrigerate! 3) Work on a floured surface. 4) Roll out to just under a quarter inch thick. Cut into shapes. My baking experience - 8 minutes flat at 175C, no more. 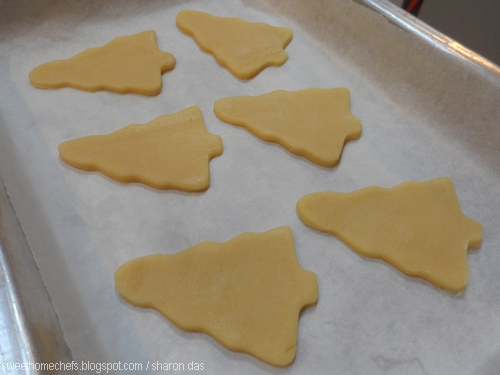 The cookies are ready when the edges begin to brown. Off the cookie dough goes in the oven on a lined baking tray. Begin icing once the cookies are cool. I tinged a third of the icing with a bit of red and the rest with green. 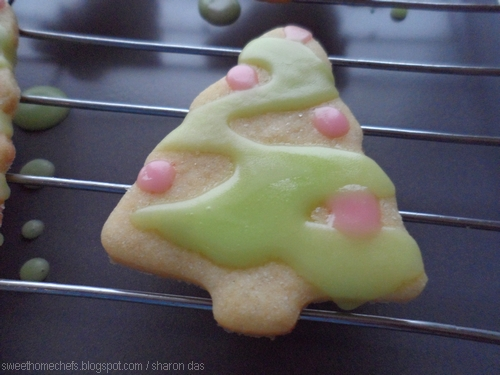 Use a teaspoon to drizzle the green icing back and forth across the cookie from top to bottom. Lastly, dot with pink icing. 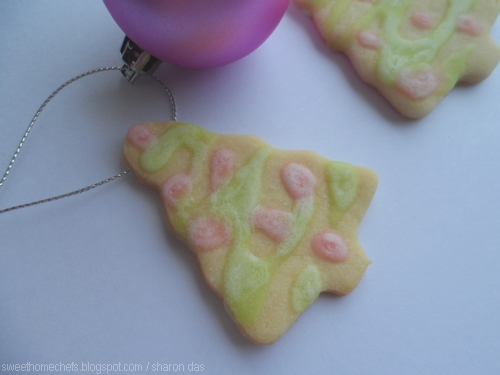 Drizzling the green icing across and dotting the light pink on! 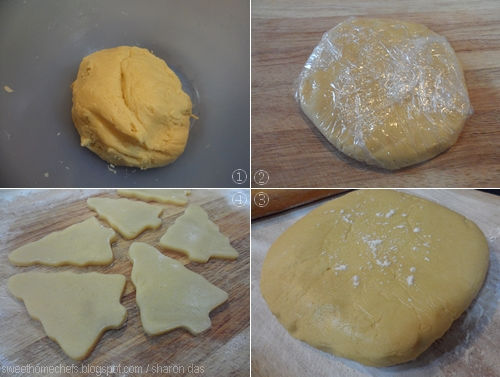 Storing tips - Stack the cookies with a piece of baking paper placed in between each layer. This prevents the cookies from sticking to each other. 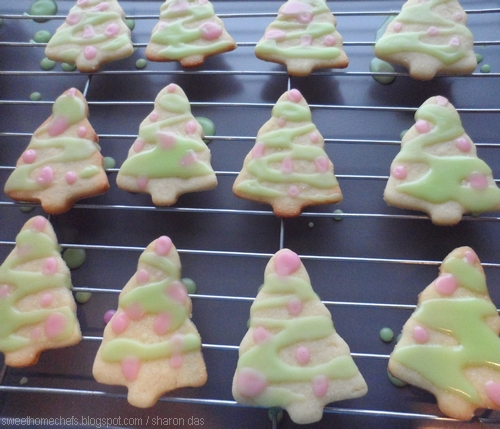 Christmas Tree cookies on the third day! I think it makes a nice gift. 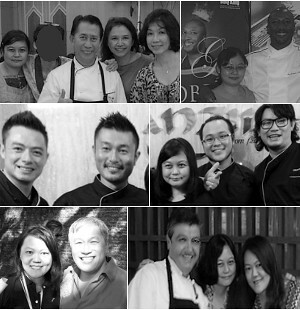 This blog post is linked to Cook and Celebrate: Christmas 2014 organised by these wonderful people - Yen from Eat your heart out, Diana from Domestic Goddess Wannabe and Zoe from Bake for Happy Kids. I like your Christmas tree cookies... Very festive! Would you mind linking with our Xmas event at http://www.bakeforhappykids.com/2014/12/egg-nog-french-macarons.html? lovely cookies, and so so sweet looking! They are so lovely and festive, Sharon. Visit Sweet Home-Chefs's profile on Pinterest. All blog posts (articles, recipes and pictures) by Sweet Home-Chefs is licensed under a Creative Commons Attribution-NonCommercial-NoDerivs 3.0 Unported License. In short: You may not plagiarise our work. You may not use this work for commercial purposes. You may only share or distribute the contents of this blog (unless clearly stated otherwise), provided that we are properly acknowledged as the author of the written piece and/or the owner of the image, with a link back to the original post.